As a birthday gift to myself, I spent 4 days and 3 nights in El Nido, Palawan. The main activity was island hopping much like my Caramoan experience. I’ve written Palawan as part of my must go places since 2016. I’ve read and heard beautiful things about the paradise island but being there was definitely different. I’ve seen different bodies of water from lagoons, sea, ocean and more. I’ve witnessed a plethora of aquatic animals from finding nemo (gold fish) to Mrs. Puff (pufferfish). And really exceeded all of my expectations. I also like to note that we booked a tour package for our El Nido trip. We paid Php 4500/person for a 4 days and 3 nights itinerary at Tripidito c/oMichael Yao. This post is not sponsored at all but I really commend Tripidito because we had an amazing experience during the trip. 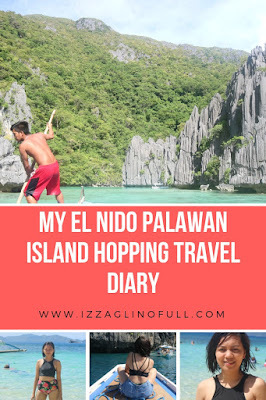 With that introduction, I am excited to share to you how my El Nido Palawan Island Hopping went. Much like my Eastern Samar trip with the family, there was no direct flight going to El Nido, Palawan. We had to get off at Puerto Princesa Airport and take a 6-hour van ride to El Nido. One of the best decision we had was booking the earliest flight from Manila to Puerto Princesa. We left Manila at 5:55AM and arrived at Puerto Princesa around 7:30AM. Upon arrival, we already found the driver of our van. We were the first ones to arrive so we were able to select the best seat for long road trip to El Nido – at the back! Got myself a good window seat! There were three stops from Puerto Princesa to El Nido – First, the Mango checkpoint wherein our van was searched for any mangoes. You can read the reason here. Second stop was a local carinderia where we had our lunch and last was a gasoline station for CR break. We arrived at El Nido proper around 2:30PM. El Nido proper is a long stretch of inns, hostels, restaurants, souvenir shops, etc. going to the pangpang or drop-off area where the boats await for the island hopping. PGomez Pension – the place where we stayed, is strategically located near the pangpang which is good. For day 1, we had our time free to roam around El Nido proper so after settling our bags at the inn we decided to go out and watch the sunset at Corong Corong beach. Spent the rest of day 1 for dinner and surfing the net at the inn’s lobby. For our second day at El Nido, the official Island Hopping started. We started with Tour A which includes some of the most iconic photos you can find on Google when you type El Nido. Tour A consists of Small Lagoon, Big Lagoon, Secret Lagoon, Shimizu Island, 7 Commando Beach. This is the El Nido drop off. We went to every place included in Tour A which was awesome. I will try to describe each and share to you the photos I took as well. 7 Commando Beach was our first stop. This was supposed to be the last stop as this was the nearest to the El Nido. But, to avoid the crowd our boat made it the first stop instead. I read in The Poor Traveler that the story of where the name 7 Commando Beach came from was there used to be seven soldiers living in the area. The names of the said seven soldiers were even written in rocks (which apparently, were nowhere to be found). This was based on the answer of the boatmen when asked. 7 Commando Beach is famous for the tree swing spot. It is a perfect location for swimming and sunbathing. The sand there is super fine and white. There are tall coconut trees, cottages you can rent and eateries to buy buko or halo-halo. We only stayed here for 45mins but really had a good time swimming (or for me floating using my life vest haha). Look at how clear the water is at 7 Commando! Secret Lagoon is also a famous spot in El Nido. Boats stop a distance away from a wall of rock formations. You get off the boat and swim (or again, float) your way to a small hole which acts as the entrance to the lagoon. Inside you will be enclosed with a beautiful view from all corners. Just imagine floating and above you is clear blue sky. Your voice also echoes inside with the rocks forming as barrier. Although our experience was immensely good in Secret Lagoon, I consider it as my least favorite spot. The water when we went there was color brown and there was a long line going inside which took up half of the 45mins allowed time we had inside. Shimizu Island is a favorite stop over for lunch. It is one of the best snorkeling area when in El Nido for the wide array of marine animal you can find. This reminds me so much of Cagbalingad in Caramoan where I had my first ever snorkeling experience. For Shimizu, we stayed in the boat to have our lunch and it was perfect. We had grilled pork, grilled fish, crabs, shrimps, eggplant and fruits. Big Lagoon is a good spot for photo-op session. It is a gigantic lagoon enclosed with magnificent limestone rocks. You arrive here in a kayak where two persons can maneuver. The depth in Big Lagoon varies so much because it starts deep then shallow (you can get off the kayak and walk) then way deeper. I am thankful for my kayak partner Ate Tin because she really guided me all the way and she’s a good swimmer so I didn’t have any fear at all. Such clear water going inside the Big Lagoon. Small Lagoon is my favorite for Tour A. Ate Tin accompanied me inside and it was such an enjoyable trip. It starts with a narrow entrance where you need to be careful as to not collide with a wall of rocks. Then inside you will be amazed by a rather huge lagoon, even larger than the Big Lagoon. What’s fun was when we were there a group of foreigners were singing from their boat all the way to the inside of the lagoon. It was so much fun to hear them sing and their voices just vibrates throughout the lagoon. They sang Circle of Life, YMCA and Sean Kingston’s Beautiful Girls. We wrapped up the first day of our tour at around 4:30PM and arrived at the El Nido proper in an hour. 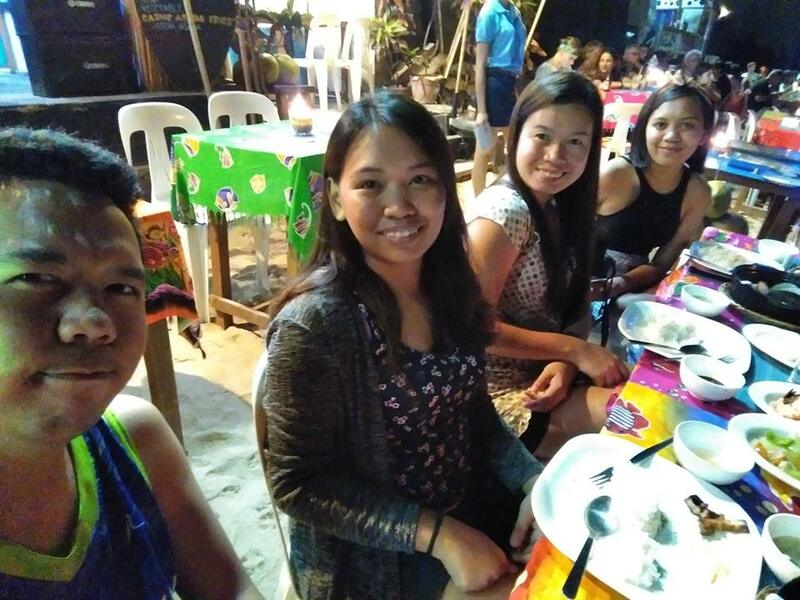 Our itinerary calls us to be back at Puerto Princesa the following day so we maximized Day 2 and spent the night exploring the nightlife scene in El Nido instead. We went to the drop-off area once again where rows of seafood paluto, bars and other stores awaits. What’s good when you eat here is that you have the view of the ocean at your front while eating. Although for practicality sake I suggest that you avoid eating in the drop-off area because the prices are too high. This is also the time when I bought pasalubongs which are magnets for 5 for Php 100. We also brought souvenir shirts within the hawkers along the drop off area. Tour C is more of a laidback kind of tour and what I find to be the one I’m more than okay to repeat when It come back to El Nido. It includes white sands, clear beaches and snorkeling areas with rich marine biodiversity, Including Tour C in our short trip to El Nido was the best decision ever. But due to huge waves and the sudden issue that happened to our boat while we were at Hidden Beach we weren’t able to go to Secret Beach and Matinloc Shrine. We had to be rescued and transferred to a different boat in the middle of the tour. Sad. To compensate with both islands we instead go to Cadlao Island, part of Tour D.
Anyway, aside from that mishap our Tour C extravaganza was A-MAZ-ING and truly beyond comparison. Let’s begin. Helicopter Island is named after its one-of-a-kind shape. It looks like a helicopter from afar. Here we were able to swim and snorkel. The water was so clear and beyond ordinary. Hidden Beach is another favorite of mine. To enter the beach you need to survive strong waves leading you to a crack between huge limestones. Once inside you can walk in the shallow water and go to the secret beach inside. The Hidden Beach is both a perfect swimming spot and snorkeling area which we enjoyed so much. Star Beach or also known as Talisay Beach is where we had our lunch. It was supposed to be at Matinloc Shrine but we were not able to go there anymore so we ended up having our lunch at Star Beach. What’s good is that our boatmen allowed us an hour of swimming first while they were preparing the food. We had a sumptuous meal of fresh crabs, shrimp, grilled pork and chicken, eggplant and fruits just like yesterday. Cadlao Island is the most memorable for me to be honest. I’m really thankful we went here because the place is soooooo picturesque. We stayed here for an hour and it was too short to really grasp the beauty of the island. The moment we arrived I was just in shock of how amazing the island is. The water is so clear and everywhere you will find marvelous limestones and rock formations. There’s part that’s shallow and part that’s deep. We finished Tour C by 5PM just right in time for our van transport to Puerto Princesa. The tour includes an overnight stay in another inn in Puerto Princesa in preparation for our flight back home. As usual the trip takes 6 hours with stopovers same as the stopovers when going to El Nido from Puerto Princesa. We arrived at our inn in Puerto Princesa around 1AM already. We stayed at Corazon Tourist Inn which for my opinion is such a good place to stay in Puerto Princesa. It’s five minutes away from the airport and at most landmarks if you want to do a city tour. Our flight is still 7PM so we instead spent the rest of that morning sleeping. When we awoke around 8AM, heavy rain poured in. So instead of going out to go to Baker’s Hill, Plaza Cuartel, Immaculate Concepcion Cathedral and the Crocodile Farm we decided to just stay at our room. Thankfully, we have strong wifi and good TV. Around 1PM the rain stopped so we went out to have lunch at a nearby restaurant. Then something amazing happened, we stumbled upon plenty of people with headdresses and when we went to where they were going we happen to witness the Subaraw Festival. This made our stay at Puerto Princesa kinda memorable too. We took photos with the amazing float waiting for the parade to start. By 5pm our van transfer to the airport arrived. We had a good two hours spent waiting at the Puerto Princesa International Airport which if I may say, is really nice and cozy. Overall, my El Nido Palawan experience was amazing. I have put that in my bucket list two years ago and to fulfill it now is such a dream come true. I will definitely go back and try the other tours as well. Have you been to El Nido, Palawan?